Lafayette, Indiana – Attorneys for Plaintiff, Design Basics, LLC, Inc. of Omaha, Nebraska filed suit in the Northern District of Indiana alleging that Defendant, Tempest Homes, LLC, of Lafayette, Indiana infringed on its copyrighted Architectural Works. Plaintiff is seeking judgment, actual damages, statutory damages, temporary and permanent injunctions, attorneys’ fees, and costs. Design Basics offers single-build licenses for their home designs, which include the architectural work and technical drawings. In the last three years, it has sold and issued more than 2,500 licenses for home plans. The copyright at issue in this case is for the Carriage Hills Plan, Registration No. VA 726-342 (the “Copyrighted Work”). For the licensing of the Copyrighted Work, Design Basics has earned more than $2,395.00 of its Six Million Dollars in total revenue since 2009. Plaintiff currently has many pending cases in Indiana against various companies it believes have infringed their copyrighted floor plans. The alleged infringement in this case was discovered in December 2015 by Design Basics as one of its representatives was searching public building records in the Lafayette, Indiana area. 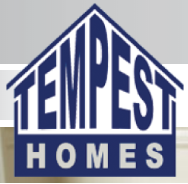 After discovering the similar floor plan, the representative viewed Tempest Homes’ website and found a floor plan, the McAllister, that looked to have been copied from the Copyrighted Work. Plaintiff claims Defendant has designed or sold homes using the infringing floor plan at least thirteen separate times. Design Basics is seeking judgment and damages for copyright infringement and the removal or omission of its copyright management information pursuant to 17 U.S.C. § 106 and 17 U.S.C. § 1202, respectively. The case was assigned to Chief Judge Theresa Lazar Springmann and Magistrage Judge Susan L. Collins in the Northern District and assigned Case 4:18-cv-00097-TLS-SLC.